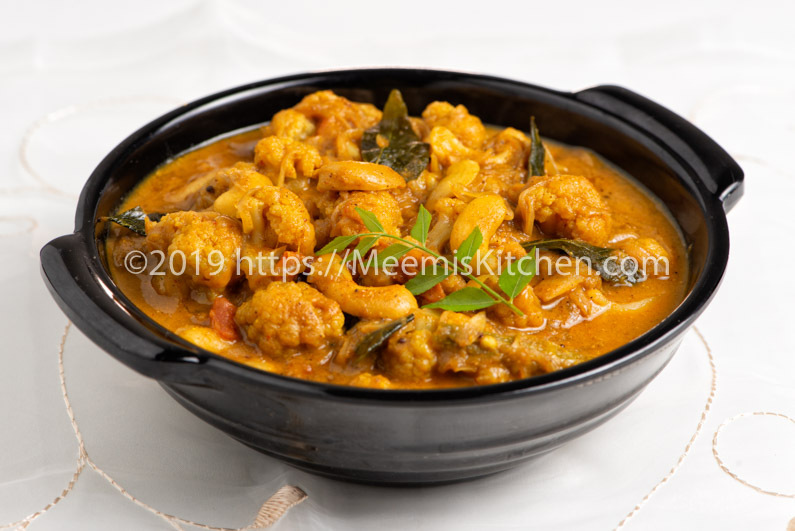 Cauliflower Mappas is seasoned with flavourful spices and loaded with the richness of cashews, thick creamy coconut gravy and delicious flavours. Everyone will love the spicy coconut gravy, the nutty cashews and crunchy cauliflower. 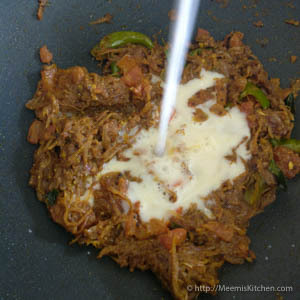 Mappas or Spicy Coconut milk curry is very popular in Kerala. Fish Mappas/ Karimeen Mappas is one of the most popular dishes in Kerala Cuisine. 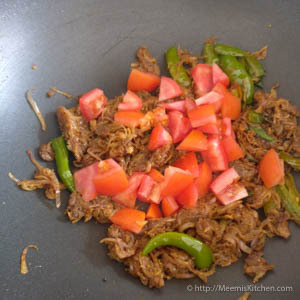 You can also prepare Mappas with Beef, Chicken and Vegetables. 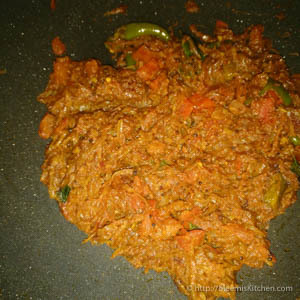 Vendakka Mappas and Kadachakka Mappas are all tempting vegetarian dishes like Cauliflower Mappas. With the Easter Noyambu/abstinence going on, I am trying out different, healthy lunch options that appeals to everyone. Finding alternatives for fish and meat lovers is not an easy task. 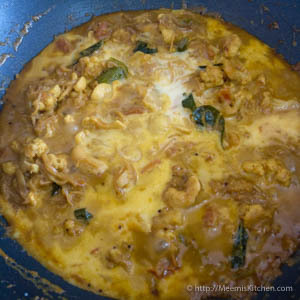 My mom used to make this Cauliflower Mappas/ Cauliflower curry during lent. 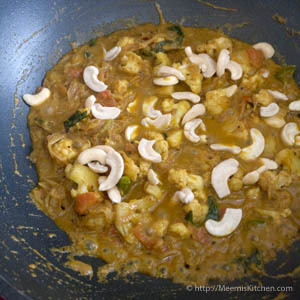 I have modified her Cauliflower Mappas and added Cashews to make it rich and delicious. 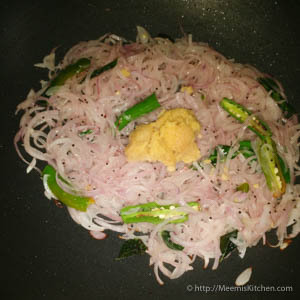 Check my link –Vegetarian side dishes for Mezhukkupuratti and thoran dishes that can be served with rice for lunch. 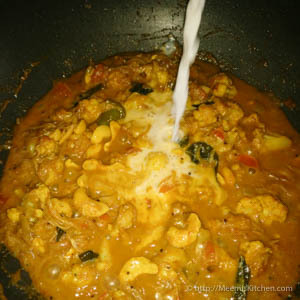 For dinner options, search recipes like Paneer Korma, Butter Paneer, Palak Paneer, Aloo Gobi, Soya cutlets, Pepper Mushroom, Soya Manchurian, Kadai Mushroom Masala, Bhindi Masala, Vendakka Mappas, Gobi Manchurian, Tomato rice in coconut milk, Paneer rice, Pulao etc. 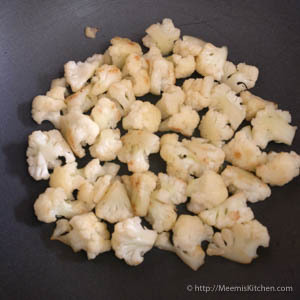 Cauliflower Mappas has unique taste and flavors and it is also very healthy. Since Cauliflower is rich in Vitaman K, it helps to maintain healthy bones and preserve bone mineral density which is vital to prevent Osteoporosis. Rich anti – inflammatory properties, anti -oxidants and vitamins present in Cauliflower work in conjunction to prevent damage and protect the circulatory system. Also, Vitamin C is abundant in Cauliflower, which helps to prevent inflammation in the body. So, enjoy cauliflower Mappas, a delectable Cauliflower recipe to serve with Rotis, rice or Pulao. Bon Appetit! 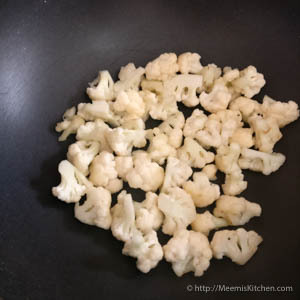 Clean and cut the Cauliflower florets into small bite size pieces. Immerse in turmeric and salt water for half an hour to remove worms if any. Once done, drain, mix with little salt and keep aside for 10 minutes. Soak Cashew nuts in very hot water and keep covered. 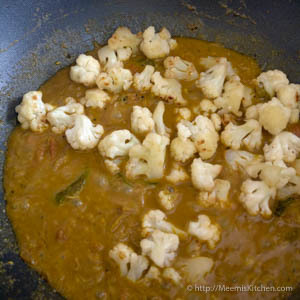 Heat 1 tsp coconut oil in a pan and shallow fry the Cauliflower florets till slightly brown. Keep aside. 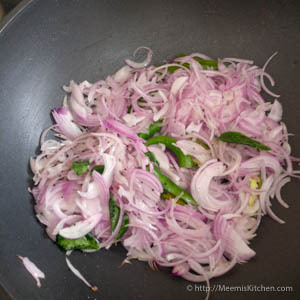 In the same pan, pour more oil and add sliced onions, slit green chilies and curry leaves. Sauté till limp and add ginger garlic paste. Fry for some more time and add all spice powders- Coriander powder, Chili Powder, Pepper Powder, Turmeric Powder, Perumjeera Powder and Garam Masala. You can add little water (2 tbsp) to avoid burning of masala. Stir for a while and add chopped tomatoes and salt. Again, fry till the tomatoes are mashed and the unique aroma starts spreading. Now, add the skimmed Coconut Milk (Randaam Paal), mix well and bring to a boil. Add the roasted cauliflower florets and Cashew nuts. Combine well, cover and cook for few minutes. Next, add the thick Coconut Milk (Onnam Paal), mix well and turn off the heat. Keep covered for some time and serve Cauliflower Mappas with Rotis, plain rice or ghee rice. Enjoy! Always soak Cauliflower florets in Turmeric and salted water to remove worms if any. You can roast the cauliflower florets in ghee/ Butter for more flavor. You can also roast the cashew nuts in ghee/ Butter if you like roasted cashews in curry. 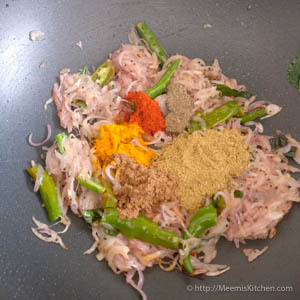 For preparing Perumjeera powder, toast fennel seeds in a pan, let it cool and grind it to get fine powder. Check the link for “How to make Garam Masala at home” for best results. Serve Cauliflower Mappas with rice or rotis. If you like this Cauliflower Mappas recipe, share with your friends using the share buttons on the side or put in your comments. I will be happy to see your comments. God Bless!! Thank you Sheba. It is a variety recipe with Cauliflower.